Electromagnetic Pollution is an invisible health threat. Also known as E.L.F.R. (extremely low frequency non-ionizing electromagnetic radiation). Science has proven that bioelectric impulses control our bodily functions. Modern electromagnetic fields (EMF) in our environment can cause stress at the cellular level. With the proliferation of more and more electronics, cell phone towers, Wi-Fi networks, hydro towers, and wireless products, we are becoming exposed more than ever before. By applying our ELFR ELIMINATOR chips to common household and office devices, dangerous low frequencies of radiation are brought to normal, healthy levels. They do not affect the quality of transmission of a cell phone, or harm electronic equipment in any way, but rather they harmonize the electric and magnetic field to eliminate low frequencies of radiation. They provide EMF PROTECTION. This is accomplished using a specific zinc and copper formula. It is a safe and natural scientific process.They have been tested, used and recommended by homeopathic and holistic practitioners world wide since 1997. Apply one chip per device. Use them and protect yourself from EMF Electromagnetic Pollution. 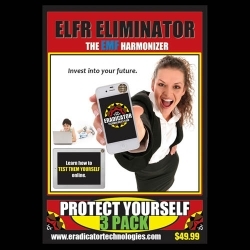 ELFR ELIMINATORS are easy to use, fit on all cell phones, computers, and wireless products. They attach in seconds, and do not expire. Place the chip on the front or back of any normal electronic equipment. There are several ways of testing the effectiveness of the ELFR Eliminator. ELFR Eliminators protect you from exposure to radiation produced by these products, and therefore make them safe to use. So these chips can help with your personal products. For EMF Protection from other sources, such as the cell phone towers, Wi-Fi networks, and hydro towers, we offer other products like the Lotus Shield and Geopathic Stress Kits. ELFR ELIMINATORS are available in singles, packages of three, family packs(20), and wholesale boxes.